Click the icon for the web based version of the calculator. F- stop printing was originally made popular by the award winning printer Gene Nocon in 1987. If you want the full explanation, you can find it in his book Photographic Printing (now out of print, but pops up second hand), or you could take a look at this interview with him. Put fundamentally, F- stop printing is the conclusion to all the other methods of exposure control you have made in getting towards your negative, because an F- stop is a unit of Exposure. When you make an exposure in your camera, if you make a change from F8 to F5. 6, you are letting more light in by increasing the aperture by 1 F- stop. You are doubling the amount of light reaching the film. 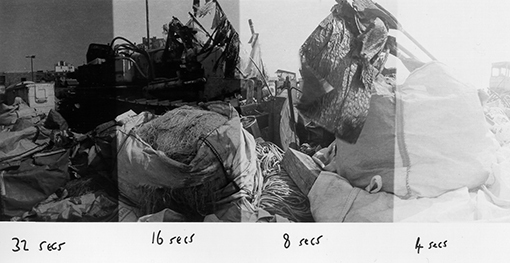 If you changed your shutter speed from 1/ 125 to 1/ 60, you are also doubling the amount of light reaching the film, by 1 F- stop, although you are using time to achieve this. If you load a 400 ISO film instead of a 200 ISO film, you are increasing the sensitivity of the film by doubling it, or 1 F- stop, but this time using the sensitivity of the emulsion to achieve this. The idea of F- stop printing is that you continue this process through to the exposure on your photographic paper. 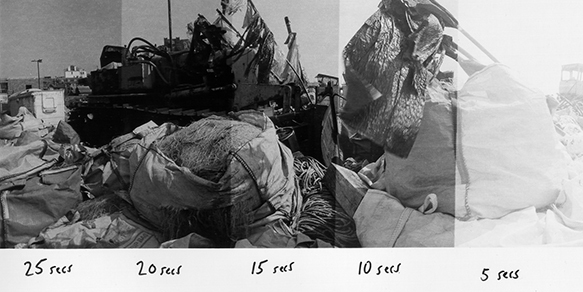 An initial test strip could end up being 4, 8, 16 and 32 seconds, with each step exactly one F-stop apart from the next (doubling or halving the overall exposure). A linear strip might be 5, 10, 15, 20, 25 seconds giving a test strip of equal time intervals, but diminishing exposure intervals with 5 steps giving a shorter overall range than the 4 step strip. In the two examples, the F-stop strip has very clear divisions going from too light to too dark, it is easy to see the dividing points and judgements can be made easily. In the second example, the strips at the high end with the fixed time intervals, become increasingly hard to define and, because the intervals are not the same in terms of exposure, judging the correct one becomes harder. The linear approach, rather than the F-stop approach (sometimes called logarithmic or geometric), does not give even results and makes judging and burning harder. I have developed an F-Stop Printing App which runs on iPhone, iPod Touch, iPad, Android and Amazon Fire devices. It is free and has a red light option allowing you, with care, to run it in the darkroom. It is available from Digitaltruth Photo, click the link. F-stop timers use a logarithmic rather than a linear interval and, therefore, produce an easier to read test strip as the exposures are exactly equal. If you want an F-stop timer in your darkroom, then go here. I have no connection with RH Designs, I have simply used their timer for many years. If you already have a timer, or cannot afford an F-stop timer, then use the F-Stop Printing Calculator to work out the 1/4 stops. All printing courses I teach include F-Stop techniques. I teach at Kensington and Chelsea College and at other centres, I am also available for teaching single sessions to groups or individuals in my darkroom or yours, contact me. I am impressed with the F-Stop Printing calculator and the fact that it does the maths for you!